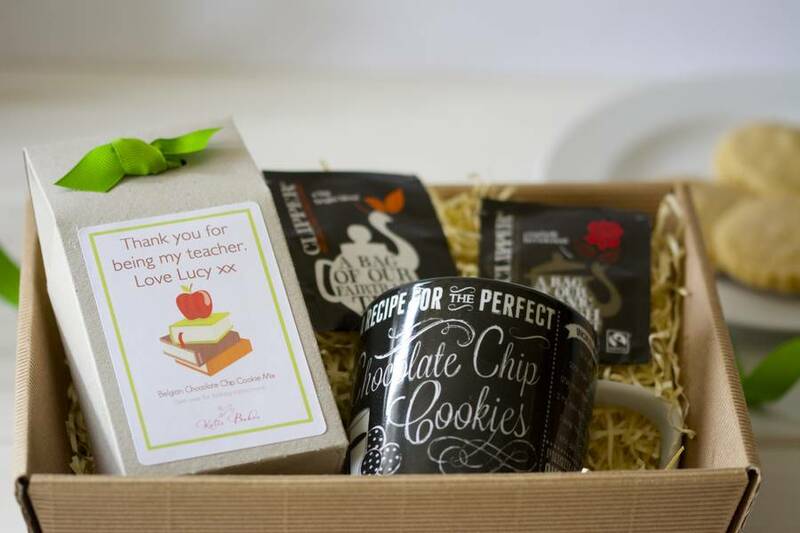 A personalised Teacher's DIY Tea and Biscuits Hamper containing a lovely mug, Fairtrade tea and our delicious "clever cookie" Double Chocolate Chip Cookie Mix. A lovely gift for your child's teacher to say thank you. 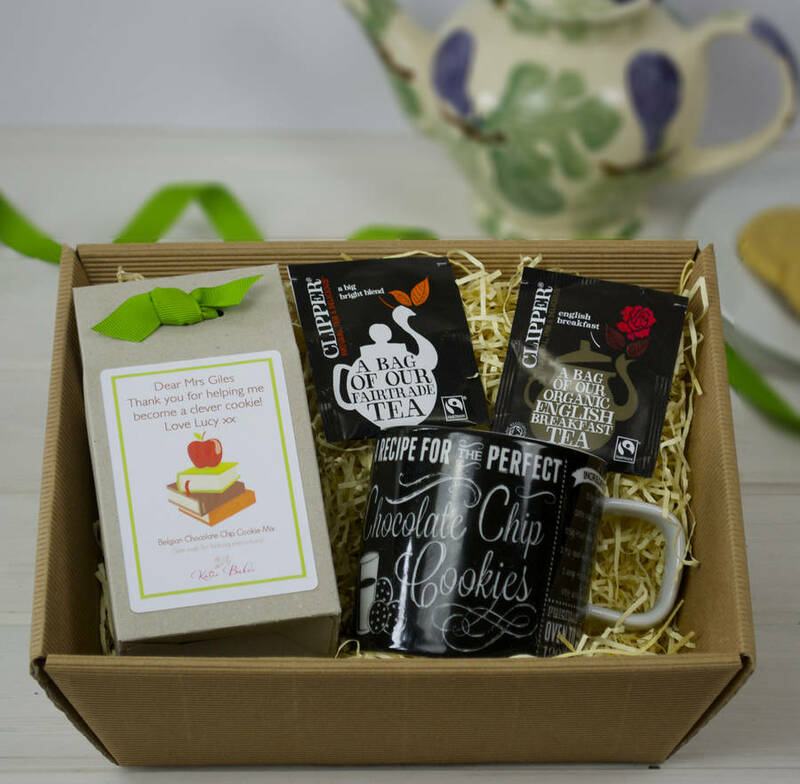 The hamper contains a blackboard effect mug, fairtrade tea and a personalised chocolate chip cookie mix to make delicious homemade biscuits. The kit comprises the following, all packaged in a card tray with a clear lid, tied with raffia. - One, individually wrapped, Clipper Oraganic English Breakfast Teabag. - One, individually wrapped, Clipper Fairtrade Teabag. - A porcelain Chalkboard effect mug. 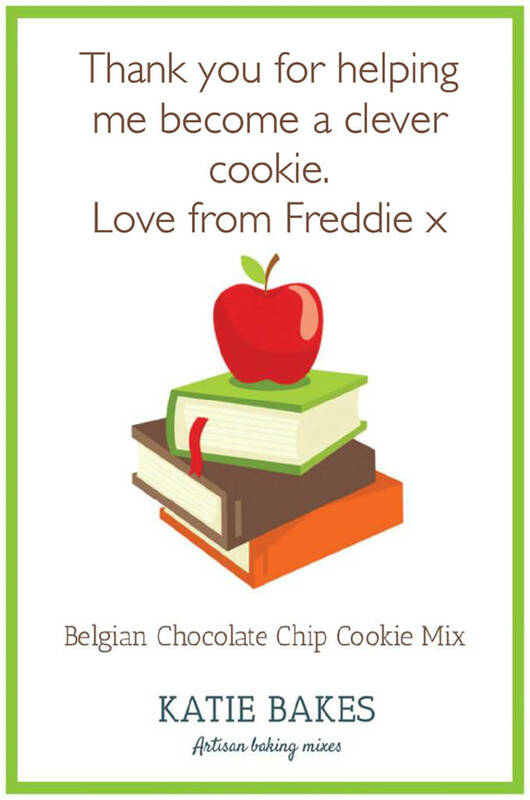 - A foolproof cookie mix which can be personalised with a special message for your child's teacher. You have a choice of either our "Apple" themed teacher label or our "Wise Owl" themed label. You can also choose from two cookie mix flavours, Rich Shortbread Mix or Double Chocolate Chip Cookie Mix. 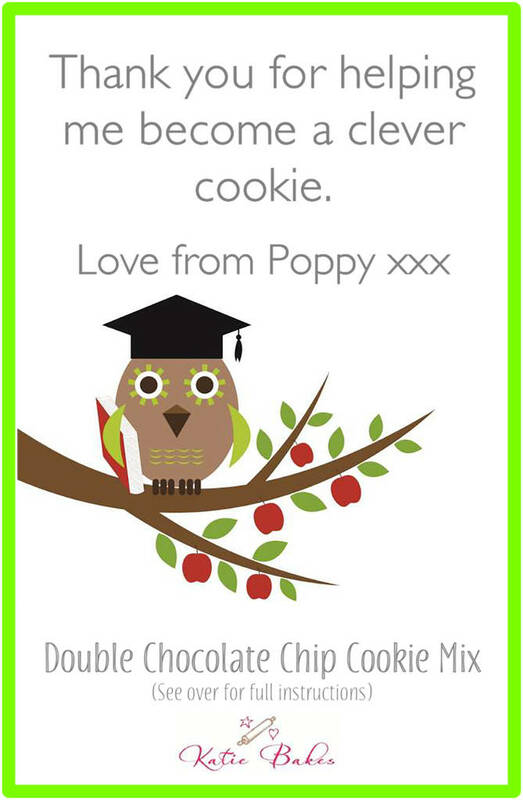 The wording on the cookie mix labels can be personalised with any short message you would like. Please enter your message in the relevant box when placing your order. 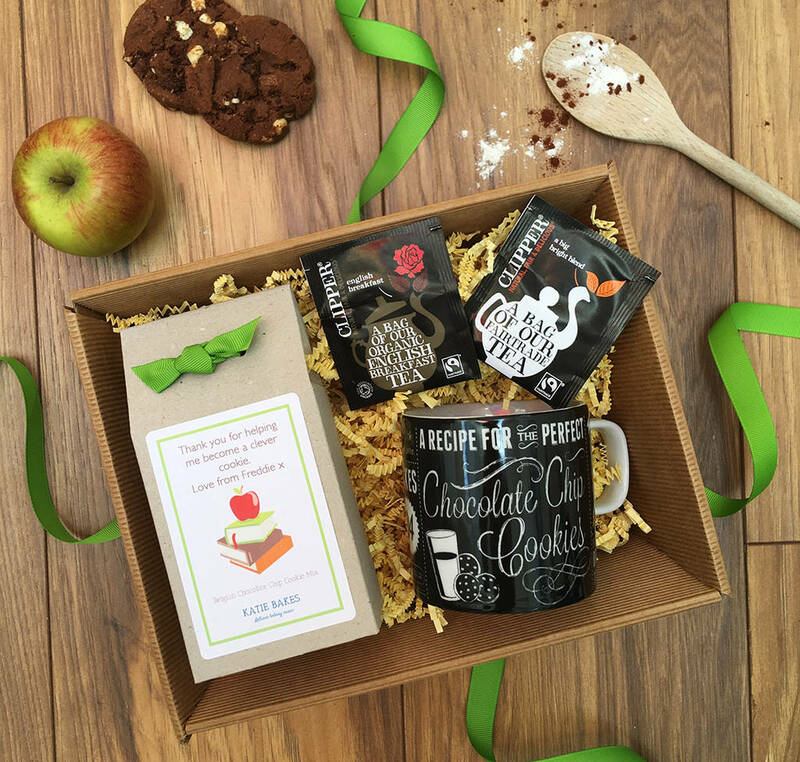 The DIY Tea and Biscuits kit is packaged within a cardboard tray with a clear acetate lid beautifully tied with black raffia. Mug: Fine porcelain, microwave and dishwasher safe. The cookie gift boxes are made from recycled cardboard with a Grossgrain ribbon decoration. The mixes in the boxes are packaged in polypropylene bags for freshness. 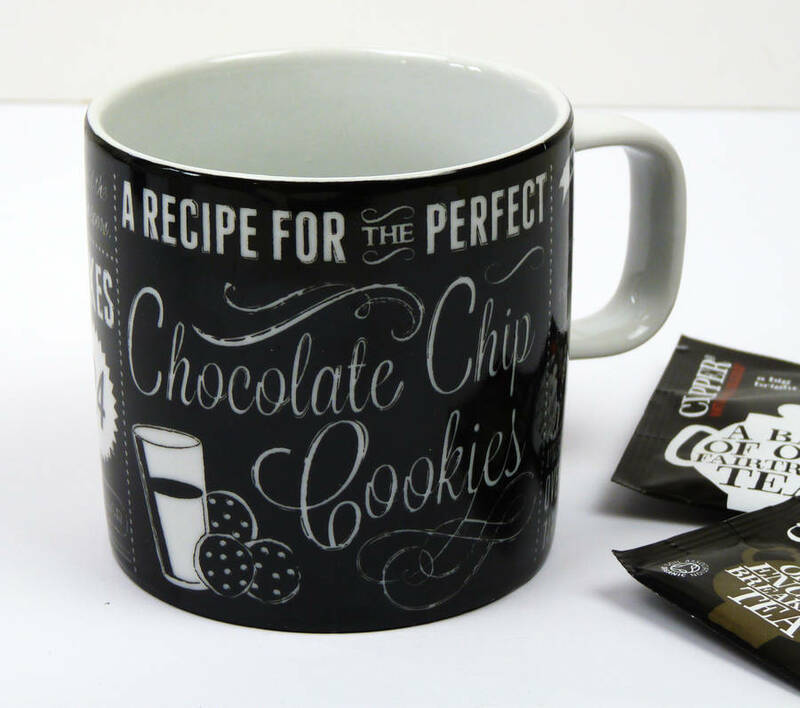 The cookie mix which is blended by hand, contain the highest quality ingredients, including British flour and no artificial colours or flavourings and just require the addition of melted butter to make delicious cookies. Full baking instuctions are included. Rich Shortbread Mix Ingredients: Wheatflour and Sugar. Double Chocolate Chip Cookie Mix Ingredients: Wheatflour, sugar, cocoa and Belgian white chocolate. The mix does not contain nuts but is produced in an environment where nuts are handled. Cookie Mix box dimensions H 16cm x W 8cm x D 4.5cm. The box tapers at the top. The cookie mix make approx 10-12 cookies. 2 x individually wrapped single tea bags.